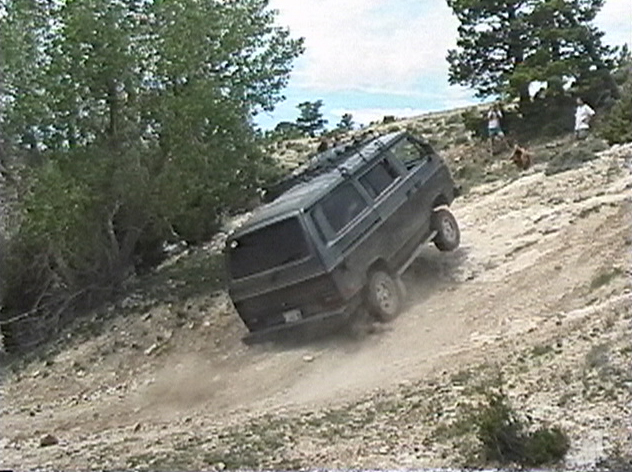 We left camp at Horsehoe Bend and headed up Sykes Ridge Road, northeast from camp. See and enlarge the map to the right. Sykes Ridge Road runs north and south and was mostly mild 4-wheeling, but moderate in a couple places. On this trail we entered Montana from Wyoming - sort of interesting doing "interstate" travel on a trail for some reason. 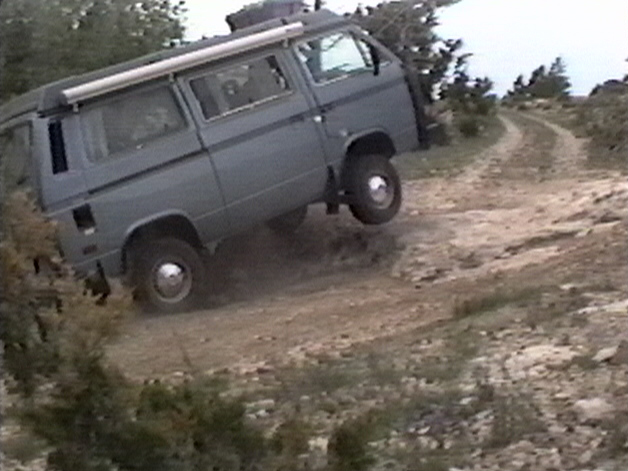 At one spot, there is a serious and steep left-hand switchback (we nick-named "Sykes Switchback") with a large rock obstacle just as you come through the curve. We stopped here and discussed the proper line. It took a couple tries, but everyone made it, no damage. From here we continued up the arid ridge, with very nice scenic views down into Bighorn Canyon to the east. We were treated to occasional views of bands of wild horses and Bighorn Sheep, the namesake of the canyon below. Click map to enlarge map. We turned toward the west and went south on Burnt Timber Ridge Road and were treated to more views and great scenery while descending this ridge. Together, Sykes Ridge and Burnt Timber Ridge roads make a very nice loop. 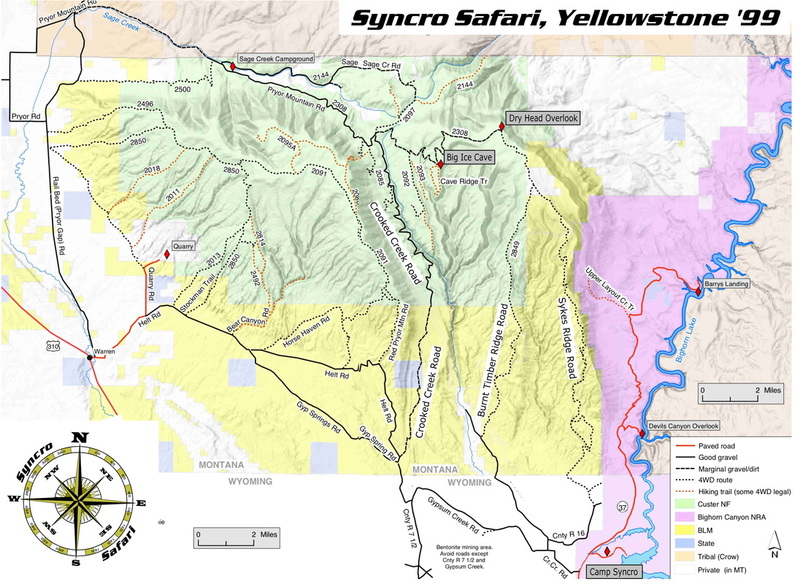 If you're taking this loop and not planning on more time in this area, continue north from the junction of Sykes Ridge and Burnt Timber Ridge and visit the Dry Head Overlook about four miles from the junction. Great views from up here! At some point along Sykes or Burnt Timber we stopped and took a short hike to a viewpoint, the highest spot in the area. With storm clouds around, and some thunder and lightning in the distance, we all started to feel the tingle of static electricity in the air and decided staying at the top of this ridge wasn't the smartest option, and headed back to the Syncros. No one struck by lightning on this trip! 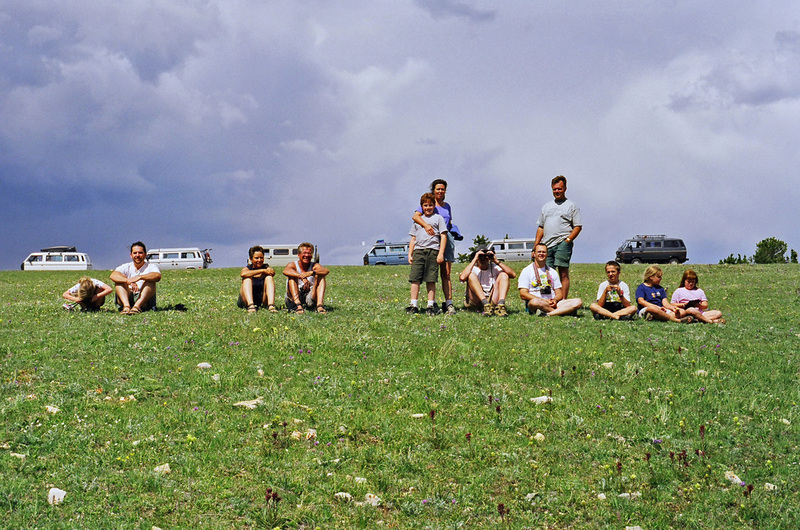 At the end of the day, we returned to Camp Syncro at Horshshoe Bend and another night in Wyoming. Here, the wind was howling and it started to rain as well. With the tent pushed into a teardrop shape from the wind and the rainly only teathered to the teny at one corner, the persistant pleas of the Davis kids conviced mom & dad to rush into town for a motel on this night. We were grateful there was a room available. The rest of the intrepid adventurers were much more snug INSIDE their Syncros! Crooked Creek Road is a combination of well-tamed dirt and graded gravel surfaces, so it's not really, 4-wheeling. 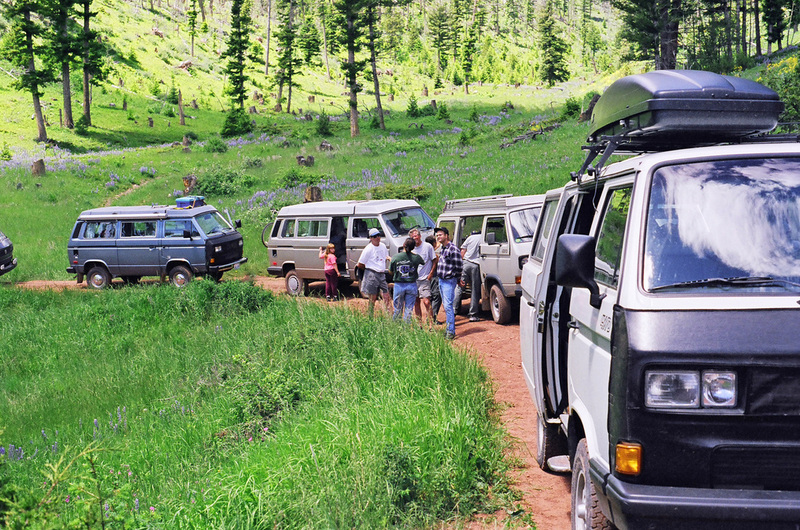 At least in 1999, a 2WD Vanagon would make it along this route just fine. This was a very scenic route and is much more forested and lush compared to the rocky ridge routes of Sykes Ridge and Burnt Timber Ridge. Many wildflowers, grassy meadows and some lucky Syncronauts even saw a small black bear in the trees, just off the road. 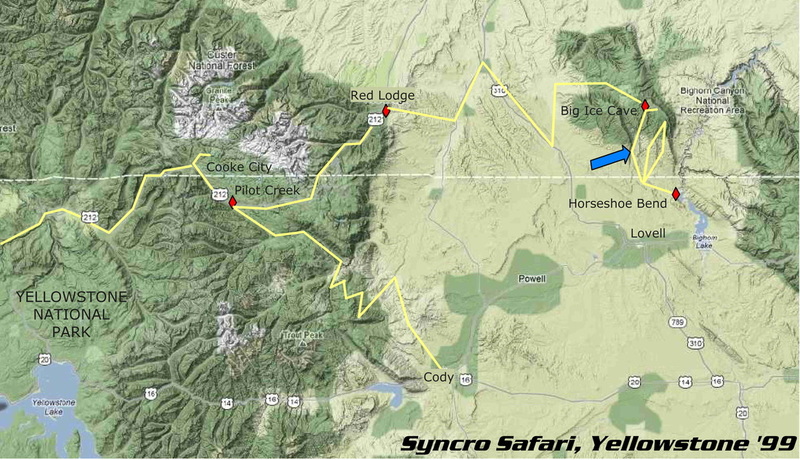 Along this route we spotted the wild horses that the Pryors are known for. The horses were not all that close today, but still it was very nice to sit and relax a while on the grassy hilside, watching the wild horses across the way. It was a cloudy day, threatening rain and thunderstorms, but nothing really materialized. 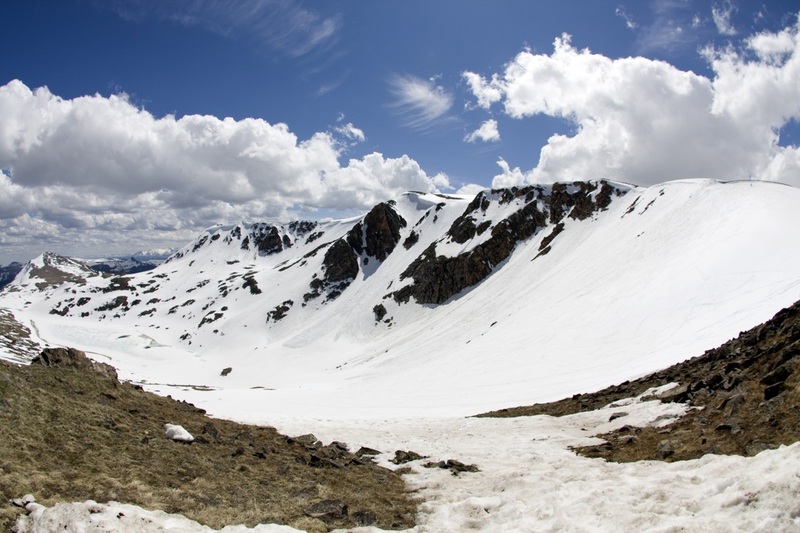 We continued up Crooked Creek and turned east on Pryor Mountain Road to Big Ice Cave. Here we checked out the ice cave where ice stays inside this protected cave year round and made our second "Camp Syncro" for one evening. Leaving Big Ice Cave we traveled east a bit up to Dry Head Overlook and took in the 360-degree views from this highest spot in the area. Juergena and Hanna split off from our group to contiune their "North American Tour" and headed north and east back across Canada. 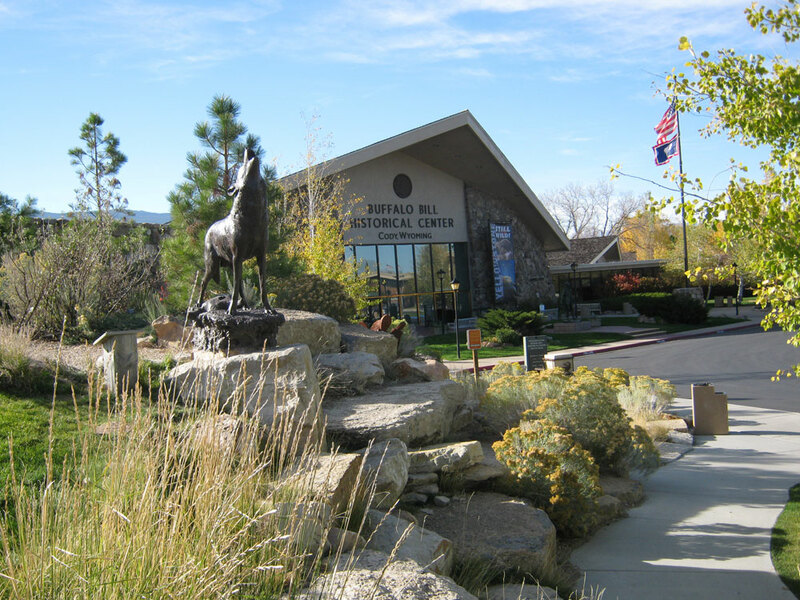 The rest of us traveled west again past the ice cave area on Pryor Mountain Road and US310 through Bridger, near the Kirk family homestead, Hwy 72, Belfy, Hwy 308, Bearcreek, Washoe and Red Lodge. 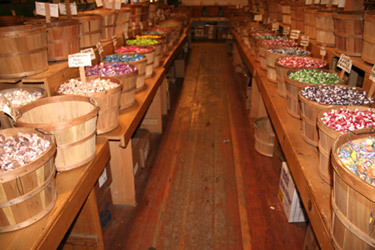 In Red Lodge we visited an authentic, old-fashioned candy store with hundreds of varieties of candies in wooden baskets and bins, a dozen or more kinds of fudge and more. Wood plank floors, candy bins and the smell of sugar in the air! Just what we needed. This evening we stayed at the home (and camped in the yard and driveway) of a friend of Tom & JeanAnn Kirk. "Yay!" - for taking showers! Departing Red Lodge and heading south, one quickly begins the ascent up the north slopes of the Beartooth Mountains on the Beartooth Highway. This is an amazingly scenic drive, climbing steeply though numerous switchbacks. 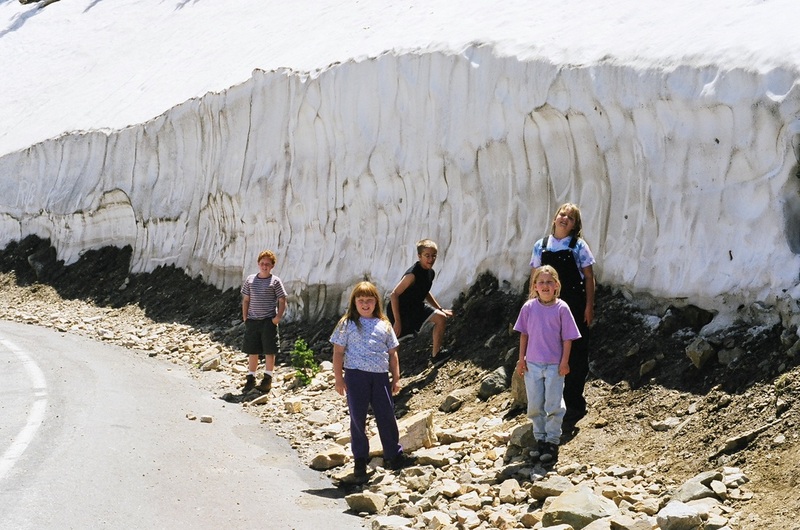 Even though it was the end of June, this route had only been cleared of snow a week or so before and the snowpack on the sides of the highway was over 12 feet deep in places! 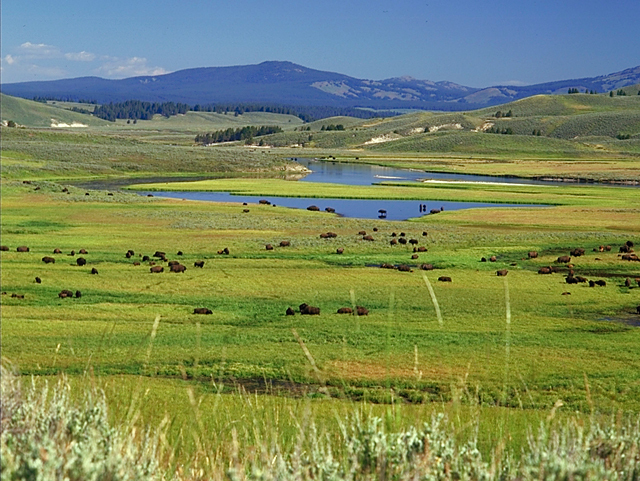 If you're in this region, you really must travel up and over the Beartooth. Along this route, we stopped for a time and helped Tom & JeanAnn out with ski shuttle service. We brought them to the top side of Gardner Headwall where they skied down to the canyon below and then hiked back up to where we'd doubled back to pick them up. The wind and cold here were taxing and we stayed huddlled in our Syncros drinking hot chocolate and trying to stay warm until Tom & JeanAnn returned. I can't believe we don't have a single photo of them with skis! From here we made our way over the pass and down the southwest slopes to our next Camp Syncro at the confluence of Pilot Creek and Clark's Fork of the Yellowstone River. This was a nice spot along the river, but oh, the rain! Having a leaky tent in the middle of the night is no fun and adding a tarp in addition to the rainfly at night, while it's raining is not for the faint of heart! Serge & Claire and their girls left to head east to visit family in Quebec and the remaining crew enloyed some local adventure and returned back to Pilot Creek. Kirks, Bests, and Curt Long decided it was time for more 4-wheeling and went northwest toward Cooke City, Montana and found a good (or bad, depending on how you look at it) trail near Daisy Pass Road. 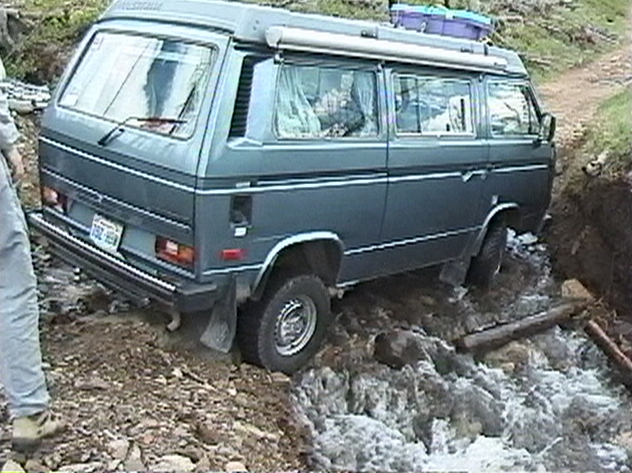 This was the most extreme 4x4 adventure of the week, requiring a significant amount of stone-stacking to allow creek crossings, followed by a couple traverses across snow drifts. The Davis family decided spending at least most of the day outside the Syncro was a good idea, so we headed east to Cody, Wyoming and visited the Buffalo Bill Historical Center (http://www.bbhc.org/) and got to see some interesting and educational things in the Buffalo Bill, Plains Indians, and Firearms museums. Matthew and Laura were being homeschooled, so this "counted" toward curriculum progress too! 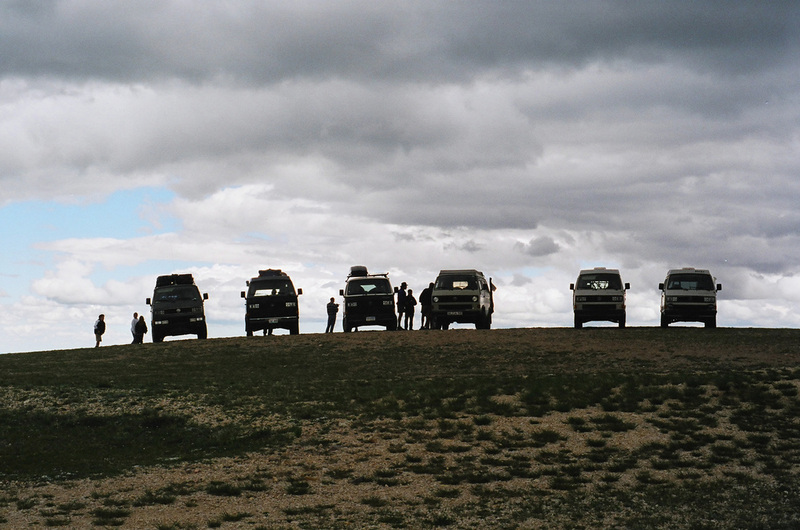 While Curt Long and Steve and Eric Best went on to other sights on their ways home, Davis' and Kirks headed west through Yellowstone National Park. Here we say wildlife including moose and elk and got ice cream cones to enjoy. What a great way to end our trip!